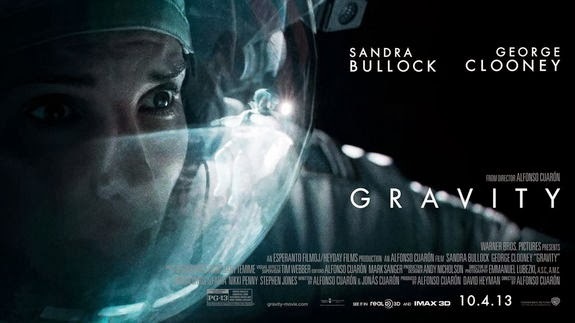 This movie tell us a story about how Dr. Ryan Stone (Sandra Bullock) must survive in space and attempt to come back to earth after her space shuttle mission fail. Honestly, this movie didn't bore me at all. People who said this movie is boring probably are the one who had particular interest in action movie or dramatic movie. But it's pretty short so I don't have any time to be bored. The main point of this movie is the special effect and the cinematography. It's superb! Make me feels like I was in space and the pictures are really beautiful. I watch it in 3D and when the debris of space object move towards Sandra Bullock, I unconsciously held my breath. The acting is good too. There are only two main actors here, Sandra Bullock and George Cloney (Btw, he is charming, naughty, and funny as Mark Kowalsky). There are thrills and tensions in this movie but personally it's not thrilling enough for me. Strangely, I cry in the middle of this movie. It's not a sad movie. It's a survival movie. But I can't hold back my tears when Dr. Ryan Stone is in a desperate situation, thinking about her life and how she doesn't have any motivation to live anymore, then attempt to commit suicide through hipoxia. It made me contemplated and gave afterthought to my whole live and the fact that I don't really have strong motivation to live. Ho ho ho. Why suddenly I talk about something sad? By the way, I recommend you to watch this movie in 3D. I bet Gravity will win Oscar for Best Special Effects. Have you watch it in cinema? What do you think about this movie?